Foxes look a lot like dogs and act a lot like them in many ways, which makes sense as they are related to dogs and wolves. However, one major difference between foxes and most members of their scientific family is that foxes do not hunt in packs at all. While they may live with their young in burrows, older foxes hunt and live alone the majority of the time. During their one reproductive season of the year, they average about six children per litter, although it can range from as few as one to as many as 11. When they are born, foxes cannot open their eyes for nine days and have to live with their mother in the burrows. Unable to venture out for food, the father has to find food for the entire family, as the parent foxes care for their children. While they are much closer to dogs genetically, a fox has some traits in common with cats as well. They have large whiskers on both their face and legs to help them navigate through grassy areas. Additionally, their claws are partially retractable, which is a trait common among cats but rarely present in dogs. Another minor trait is that they have more vertical pupils than rounded pupils which most dogs have. Since foxes have a reputation for picking off livestock and eating small animals, fox hunting originate in the United Kingdom in the 16th century as both a sport and legitimate way of controlling the fox population. Nowadays, fox hunting with the use of dogs is banned in the UK, although the tradition is allowed to continue without dogs. In countries such as Canada, France and the United States, fox hunting still continues as a recreational sport. 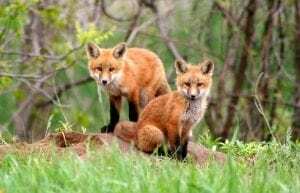 While foxes’ diets mostly revolve around the nutrition from eating other animals such as rabbits, lizards, rats, birds and bugs, they are omnivores and much of their nutrition comes from non-animal sources. Fruit makes up a large part of their diet, with foxes opting for berries along with nuts as well when they can find them. While small berries are easier for foxes to eat, they can handle fruits such as apples as well. If you think you have a fox problem on your property, call the experts at Shumaker Animal Control to deal with the problem for you. Our experienced team will take care of the problem in a timely manner, ensuring that you, your home and pets are not in any danger. This entry was posted on Wednesday, March 20th, 2019	at 11:30 am	. You can follow any responses to this entry through the RSS 2.0	feed. Both comments and pings are currently closed.